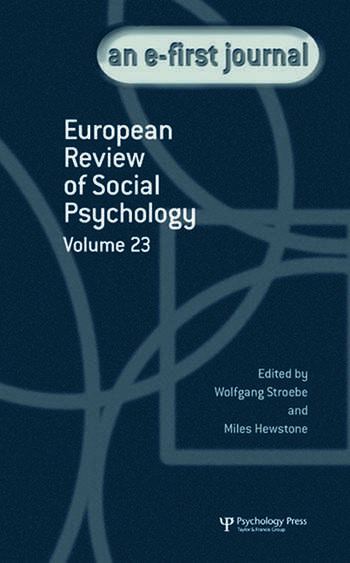 The European Review of Social Psychology (ERSP) is an e-first journal published under the auspices of the European Association of Social Psychology. ERSP is an international journal which aims to further the international exchange of ideas by providing an outlet for substantial accounts of theoretical and empirical work, whose origins may be, but need not be, European. The emphasis of these contributions is on substantial individual programmes of research and on critical assessment of major areas of research, as well as on topics and initiatives of contemporary interest and originality. All articles published by the European Review, whether commissioned by the editors, assisted by an international board of established scholars, or spontaneously submitted by authors are externally reviewed. Publication is subject to a positive outcome of this review process. ERSP (now in its 23rd year) is widely accepted as one of the major international series in social psychology and accessed by all important abstracting and indexing services, including the Social Science Citation Index. With its e-first publishing model it offers authors an opportunity to participate in a well-respected publication and to disseminate their ideas quickly, while allowing readers the chance to see individual articles as soon as they are completed, without waiting for a whole volume or issue to be prepared. Future thought and behaviour change G. Oettingen. We are human, they are not: Driving forces behind outgroup dehumanisation and the humanisation of the ingroup J. Vaes, J. Leyens, M. P. Paladino, M. P. Miranda. A goal model of catharsis M. Denzler, J. Förster. Effective regulation of affect: An action control perspective on emotion regulation T. L. Webb, I. S. Gallo, E. Miles, P. M. Gollwitzer, P. Sheeran. A social-psychological perspective on tacit coordination: How it works, when it works (and when it does not) E. W. de Kwaadsteniet, E. van Dijk. Psychological effects of risk glorification in the media: Towards an integrative view P. Fischer, J. I. Krueger, T. Greitemeyer, K. Asal, N. Aydin, E. Vingilis. The social identity theory of leadership: Theoretical origins, research findings, and conceptual developments M. A. Hogg, D. van Knippenberg, D. E. Rast. How to achieve synergy in group decision making: Lessons to be learned from the hidden profile paradigm. S. Schulz-Hardt, A. Mojzisch. A social mind: The context of John Turner’s work and its influence S. D. Reicher, S. A. Haslam, R. Spears, K. J. Reynolds.